To start, a common question I hear often is: What is the difference between road vs trail shoes anyways? 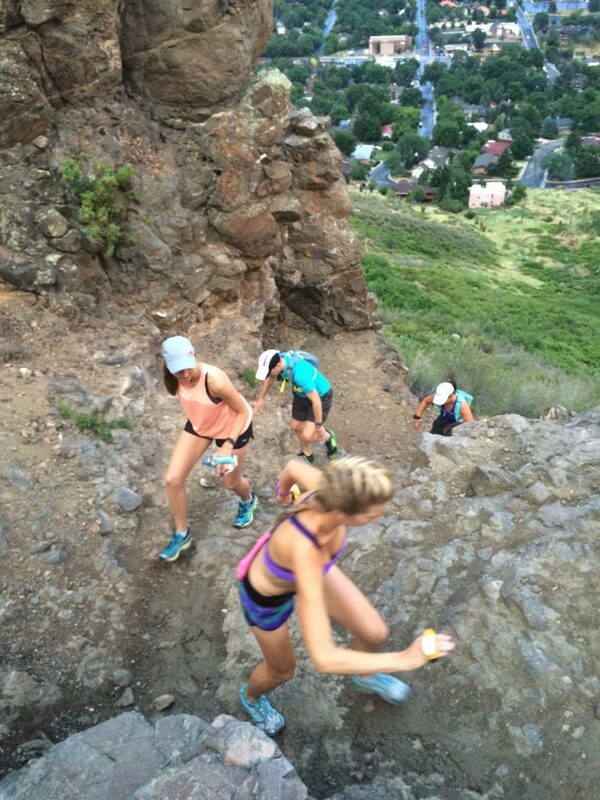 Trail shoes typically have a sturdier outer material and more aggressive tread on the soles than a road shoe. However, the main and most important difference is the addition of a “rock plate” within the shoe sole underneath the ball of the foot. As you bound from rock to rock like a mountain goat, this plate helps to protect the fragile bones in your feet. If you tend to lose toe nails or your feet sometimes go numb on a run this is a sign that your shoes are too small (or your socks too thick/tight). When I first started trail running, I was surprised to learn that I needed to go up to a size 9, a full size up from my day-wear shoes. When I made the change to larger running shoes my feet felt great! Many local running shops like Runners Roost have demo days out on the trail where you can try out a variety of different models and styles of trail shoes and the store will also allow you to return a pair if they just don’t fit right within 30 days of purchase and try another. I have several pairs of trail shoes that I use depending on the type of terrain I plan on running that day. My all time favorites are the Saucony Peregrine. They are low drop (4mm), light weight and have a moderately aggressive tread, perfect for most terrain. I prefer this type of shoe mostly for its flexibility: when trail running it is important that you can feel the ground beneath your feet to allow you to quickly maneuver around, on top of and over rocks of all sizes. 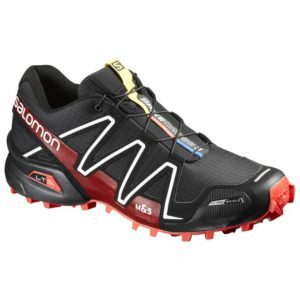 I also have a pair of the Salomon Speed Cross 3 which are my go to shoes for more extreme trail running. 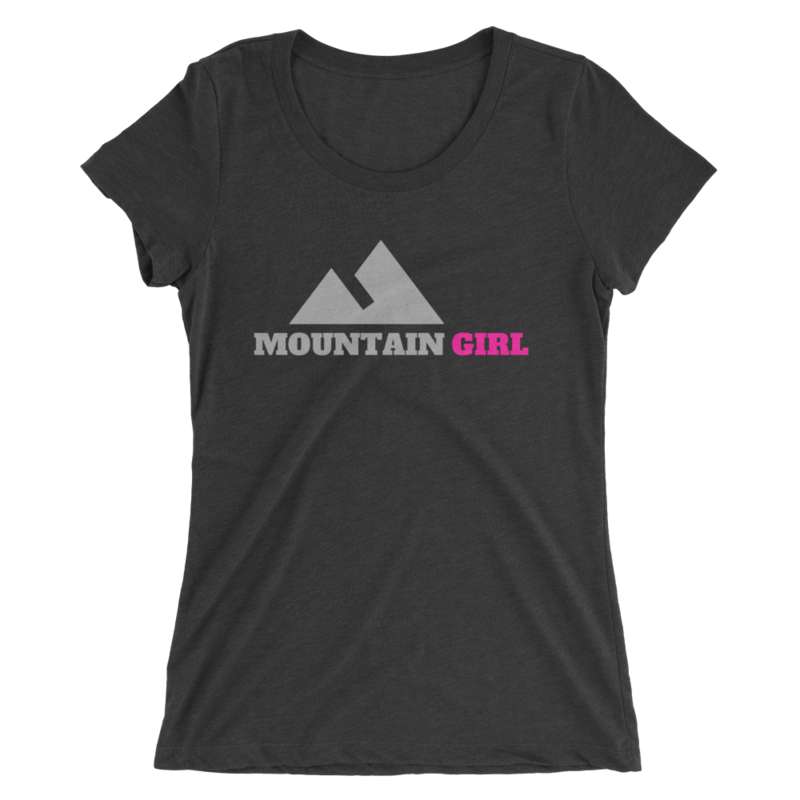 Their highly aggressive tread helps my feet “stick” to the ground on big, steep, rocky climbs and descents where I know I will be encountering loose rock and gravel. The shoes are also a bit stiffer with a thicker outsole which means more stability, perfect for trails where I won’t be traveling as quickly and agility is less important. Drop is the angle from the heel down to the front of the shoe. For decades, most running shoes were made with a significant drop, as shoe designers thought more cushion around the heel would provide less impact and more protection for the foot. With the minimalist footwear trend and changes in how we view running mechanics, many shoe manufacturers are now designing shoes with lower or “zero” drop to provide a more natural feel and foot-strike when running. I happen to agree that a lower drop and less cushion in shoes is beneficial for runners as it promotes proper running mechanics and forces us to be lighter on our feet and adapt a quicker turn-over: all factors to reduce common running injuries and help us to runner faster too! My advice on choosing a shoe based on drop is to make sure you check the drop of what you are currently running in and don’t make a drastic change right away. For example, many traditional road running shoes have a drop of 10-12mm. You certainly wouldn’t want to go to a zero drop or even below a 6mm drop for that matter. It may seem like a small change but it has a huge impact on your lower extremities. With higher drop shoes you have been running with your calf muscles in a slightly shortened position and jumping to almost a flat shoe is guaranteed to pull not only on your calf muscles but also your achilles tendon and the fascia underneath your foot. These tissues are very sensitive and the repetitive stretching as you run can lead to a bad case of achilles tendonitis or plantar fasciitis. So slowly transition to a more neutral footwear and “train” your feet and calves by walking around barefoot more often. Check out this video with some great exercises to strength your feet and ankles for runners. What about those big platform shoes you’ve been seeing all over the place? 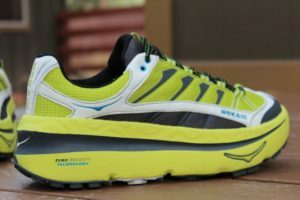 You are probably thinking about the popular Hoka One One shoes that many runners and ultra runners swear by. In my opinion, these shoes are best left for road running (I even have a pair I use for my longer road runs). The extra cushioning will help minimize the impact on your joints and put a little more spring in your step as these shoes are very light weight and typically low to zero drop. However, the most common trail running injury besides the occasional abrasion is an ankle sprain, typically caused by a mis-step or bad foot placement on a rock or root. I feel these shoes put people at a greater risk for an ankle sprain as your balance is challenged being an inch or more higher than you are used to. And if you do happen to twist your ankle on the trail the chances of a more severe sprain are much higher as your ankle has a much higher surface to turn from. Keep your shoes where they belong! If your road shoes are your Cadillac then your trail shoes are your SUV. You wouldn’t bring your brand new shiny Cadillac on an a rough and rocky 4 wheel drive road would you? By reserving your trail shoes just for trail running you will not only save their tread which can get worn down more quickly on concrete but extend the life of all your shoes. Never machine wash or dry your shoes!! Washing running shoes changes their shape as they will shrink a bit and will never fit the same. If your shoes get supper muddy or wet, just leave them out to dry and the dirt will just fall off and they will be ready start the process all over again on your next run, trail shoes are meant to get muddy and dirty, just like your off-road SUV! As winter approaches many runners resign to head indoors for their workouts on the “dreadmill” or when weather allows, shorter road runs, avoiding ice and snow at all costs. Many are shocked to learn that not only do I continue to trail run throughout the winter but it is my favorite season for the sport! In my opinion you really don’t need special shoes for winter trail running for shorter distances (under 12 miles). Some people buy water resistant shoes but if there is more than a couple of inches of snow it will find its way into your shoes anyways. Others invest in water proof gaiters however I’ve found that gaiters tend to be really uncomfortable, they either never seem to stay up or they are too restricting on my ankle and calf and rub against my skin. I know other runners who claim that when they’ve used gaiters in winter running it causes heat and moisture to become trapped in the shoe, leading to blisters. A pair of trail shoes with aggressive tread, a set of Yaktrax and an extra pair of socks are all you need for your winter trail running adventure! Your feet may start off cold but once you get moving the extra energy exerted by plodding through the deep white stuff will raise your body temperature, so this year embrace the season and give winter trail running a try! *Please note, the longest trail run I’ve done in snow (ranging from ankle to knee deep) was about 12 miles. 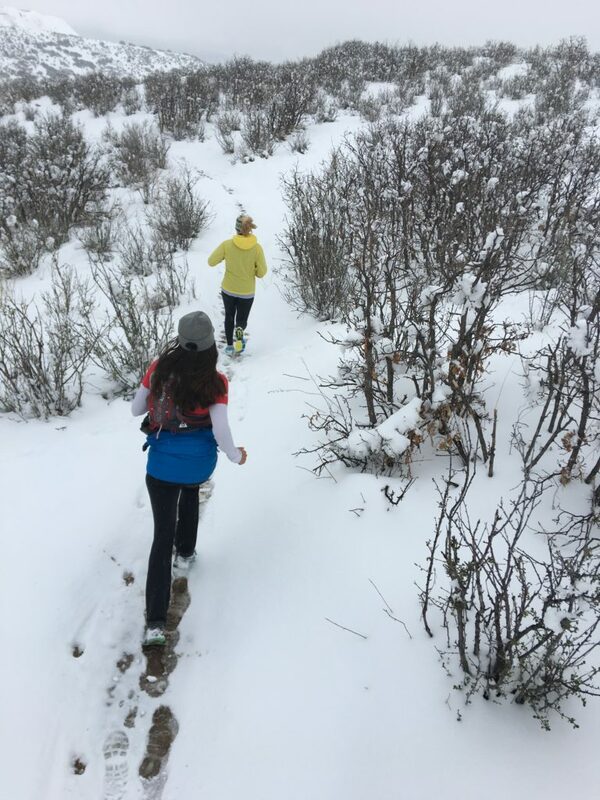 If you are planning a longer run or even an ultra in the snow you may want to conduct some additional research and test out what apparel and equipment works best for you. Here is a link to a great article about running gaiters, pros, cons and tips for winter and summer running with them.